✅ Trip Verified | For my trip from Singapore to Ho Chi Minh City, I was on Jetstar Asia's A320-200. 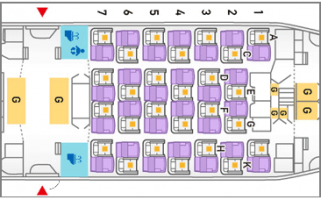 The seat onboard the A320-200 was fairly comfortable and boasts a 3x3 configuration. Boarding was fairly time consuming due to the layout of the flight. While the seat is comfortable, it ought to be improved by increasing the sturdiness of the seats. The seats are susceptible to jerking or vibrations when the other passengers attempts to move out of their row. However, taking into account that it is a budget airline, the seat quality is indeed commendable. ✅ Trip Verified | Jetstar Asia is a low-cost budget carriers and the expectations ought to be adjusted as such. As an average built, Asian man, the seat legroom was sufficient onboard this aircraft. Seat recline is slight, but is acceptable for me. One issue, however, was the issue of how the seats were often flimsy. This meant that you would end up with shaking seats when the passenger as the back visits the lavatory. Cushions are also thin, to the extent that when a passengers stows the tray table, it would be jammed into your lower back in your seat. Overall, the seats are still decent for a short-haul flight around the region. If you are embarking on a fairly far journey, you may wish to purchase the seats with more legroom as I believe these would be a fairly comfortable journey. "has a bigger leg room"
My first flight with Jetstar Asia was Manila-Osaka and the seat is better compared to a full service airline in Asia I had been flying with and also with other low cost carrier of the same route. The seat width has more space and has a bigger leg room. The cushion is not bad. I highly recommend Jetstar Asia for travelers who are flying on a tight budget yet want to experience a relaxing flight. This review refers to the extra leg room seats. The seat is leather bound and has some recline. A little on the tight side but not uncomfortable. It's quite ok for any short haul flights. Left hand side of row one has a lot more leg room than the right hand side. One has to pay extra for these seats but I think it's very worth it for the level of comfort, also you'll be the first to get off the plane. Onboard Jetstar Asi,a which is a low-cost airline with 30 inches of legroom - at the bottom of the list for Asian carriers, but couldn't complain since its low cost. Recline is very limited. Storing cabin bags in seat storage won't affect legroom a lot.